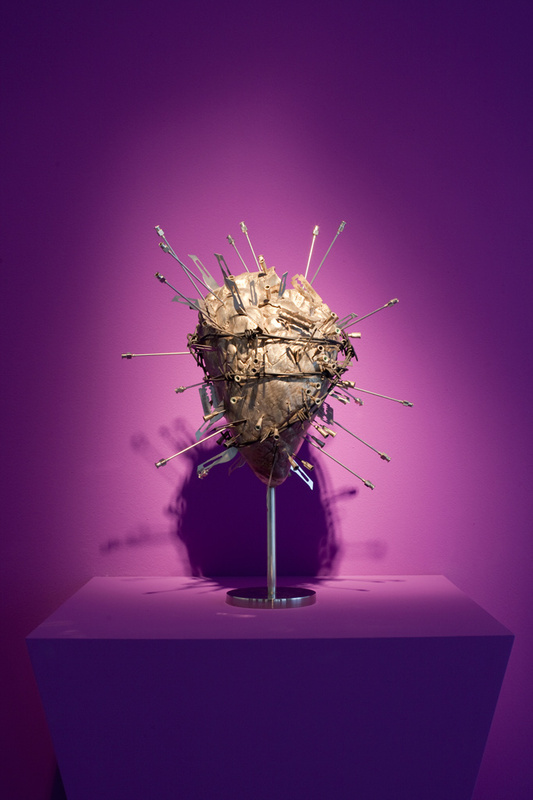 YOUR NEW EXHIBITION IS TITLED “THE SACRED HEART.” WHAT WAS YOUR DEPARTURE POINT? The original idea comes from the work of Andres Serrano and why people were so freaked out about his “Piss Christ.” The “Immersions” series, of which the “Piss Christ” is part, never struck a chord of anything against God for me. For a long time I’ve wanted to show the work of Serrano alongside real religious objects to see how they relate and show that Serrano is not at all heretical. Of course that’s the concept of the Side by Side Gallery, showing things from different periods so that they should illuminate one another. YOU’VE INCLUDED FOUR EARLY 1990S SERRANO WORKS—TWO FROM THE “IMMERSIONS” SERIES, AN IMAGE OF A BISHOP’S STAFF AND A HAUNTINGLY SPARE VIEW OF A LONE CHAIR IN THE CHURCH OF ST. CLOTILDE. The dark interior of that church is so serene and really sets the tone for the exhibition. Then came the 14th-century “gold ground” painting—the “Pieta” by Maestro della Madonna del Parto. I find “gold ground” paintings so interesting and modern. THE MADONNA AND CHRIST WITHIN THIS GOLDEN ARCH DOES HAVE A STARK SIMPLICITY AND A CERTAIN ABSTRACTION. THAT ALSO COMES FROM SEEING IT IN THE CONTEXT OF THESE MODERN WORKS, WHICH ALWAYS SHIFTS THE EYE A BIT. Exactly. If you compare it to Karl Schmidt-Rottluff’s 1919 “Moses” in the show, there is a similar expressionistic quality. It’s really getting to the essence. Putting the “Pieta” in that context brings out these qualities. THEN YOU HAVE A NUMBER OF ACTUAL RELIGIOUS OBJECTS IN THE SHOW. The “Thurible,” or incense burner, is very beautiful in and of itself, but it was used by choirboys and still smells like incense. There’s a 7th-century Islamic oil lamp that looks like the guitar of Picasso of 1914. There’s the piece made by Brigitte Nahon called “Holiness,” which is a very loose representation of the host, the little coin-shaped wafer you get in church for communion. It’s that form in a cluster made of glass. I thought it would pair nicely with the Thurible and the Serrano photo of the staff, all religious paraphernalia. THERE IS THIS DYNAMIC INTERPLAY BETWEEN THE REPRESENTATION OF THE OBJECTS AND THE OBJECTS THEMSELVES. If you choose the right objects, the grouping takes on its own meaning. I’ve done sort of a Duchampian gesture by choosing to put that incense burner in the exhibition and hanging it from the ceiling as a work of art. The Serrano image of St. Clotilde is only a photograph but the church really comes out of that photograph and permeates the space you are in. THE MEANING OF THE “SACRED HEART” IN A RELIGIOUS SENSE REFERS TO THE DEVOTION TO JESUS’S PHYSICAL HEART AS THE REPRESENTATION OF HIS DIVINE LOVE FOR HUMANITY. DID THAT INFORM YOUR CONCEPT OF THE SHOW? I didn’t know what the “sacred heart” meant in a religious sense when I first conceived the show. The act of making is in itself what I see as the sacred heart. This is how the title came about. I feel it’s almost a devotional act to go through the intellectual, physical, financial effort to make objects. Then I googled the “sacred heart.” The first thing that popped up was Damien Hirst’s “Sacred Heart,” which is now in the show. It’s an animal’s heart, cast in silver, with these blades and pins and needles and thorns, like the crown of thorns on Christ’s head. It’s part of a whole body of work Hirst did called “The New Religion.” There’s a certain element of irony because the new religion is art in a way. Also, it was very important to me to have Jonathan Borofsky’s model for a large public sculpture called “Heartlight” in the show. There’s this light that flashes to the sound of a heartbeat that comes in between the three legs as you’re standing below it. The piece speaks to the universal heart. HOW DOES AUGUSTE RODIN’S LITTLE SCULPTURE OF A FEMALE SATYR FIT IN THE EXHIBITION? IS THE 1915 “CHRIST” BY REMBRANDT BUGATTI PRIMARILY AN ARTWORK OR A DEVOTIONAL OBJECT? Bugatti was a very important artist for making bronze sculptures of animals. In 1915, a French noble family approached him about making a Christ. He said yes even though it wasn’t his thing because it was the First World War and, as the story goes, the animals, which he had sculpted with so much love in the zoo, had been slaughtered. He made this “Christ” with the whole suffering of the world; and a year after, in 1916, he committed suicide. It’s really his own epitaph, his own tombstone in a way. Is it a work of art? Is this a devotional piece? It’s a bit of everything. In the end, it’s an expression of his own distress. Meaning supersedes subject matter in art when it’s good.